More than nine million North Americans suffer from low thyroid function, but many people are not diagnosed or treated because they have never been tested. One million people take thyroid replacement pills, but some are not being treated properly because they are taking only one thyroid hormone when they need two to really feel better. Some foods raise blood sugar far more than others, and a high rise in blood sugar after meals can increase risk for diabetes, heart attacks and premature death. A study from Israel shows that some people develop surprisingly high blood sugar levels after eating foods such as bread, pizza, potato, tomatoes or bananas, while others do not develop the expected rise in blood sugar even after drinking a sugared soft drink or eating a cookie (Cell, published online November 19, 2015;163(5):1079–1094). The authors believe that by knowing which foods cause a person's highest rises in blood sugar, they could personalize a diet to lower the rise in blood sugar that follows eating. 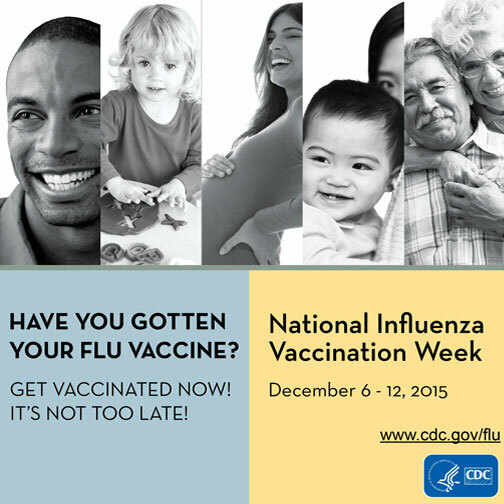 Have you gotten your Flu Vaccine yet? Call to schedule or Walk-in to get your Flu Vaccine today. People who exercise into later life are smarter than those who do not exercise. To prove that exercise preserves brain function, studies must show that the loss of brain function with aging is not just genetic. Identical twins have exactly the same genes, so a study on twins can yield stronger results to show which environmental factors help to prevent loss of brain function. A new study from King’s College in London showed that of 162 healthy pairs of twins, ages 43 to 73, the ones with the strongest legs were the smartest (Gerontology, Nov 10, 2015). The SPRINT study shows that lowering systolic blood pressure to less than 120 rather than just below 140 reduces risk for heart attacks, heart failure and strokes by 33 percent and of death by 25 percent (NIH Press Releases, Sept. 11, 2015). The Systolic Blood Pressure Intervention Trial (SPRINT) followed 9,300 men and women, ages 50 and over, who were at high risk for heart disease or already had kidney disease. The results were so dramatic that the study was stopped early. The report will be published soon. More than half of people who are treated with medication for high blood pressure do not get their systolic blood pressure below 140. If doctors follow the findings of this study they should save lots of lives. However, they should do more than just prescribe more drugs. Lifestyle changes are even more effective than drugs to lower blood pressure, without the many side effects of the medications. Welcome to Dr. Tonya Caylor!